Some kids are just natural born athletes. They are the ones that all of the kids pick at recess when the game of dodge ball comes up. You know the kind of kid I’m talking about. The one that will bounce that standard school rubbery red ball off the side of your head or hit you right in the gut when you are trying to move out of the way. They were also the kids that you didn’t want to go against when playing Red Rover because trying to run through their arms was like hitting a brick wall. They are never the kids that get picked last. Everyone wants them on their team because they know that they will win if that kid plays with them. You were just a glutton for punishment if you were on the other team. Matthew seems to be one of those natural athletes, but mostly for the game of ice hockey. He started out playing t-ball at the age of 5 but he was too bored waiting for someone to hit the ball into the outfield. When you have a team made up of a bunch of 5 year olds, that does not happen very often. On the rare occasion that it does, the entire team runs out to the outfield, including the catcher so it was not really clear why Matthew was even there in the first place. I had so much fun watching him in the outfield. He would be sitting in the grass looking at bugs or kicking the dirt or just staring at an airplane going by. It was clear that baseball was definitely not going to be his sport. He then decided to try karate. Now karate was something he liked because he was always moving around, kicking in the air and getting to yell “Hy YAA”. He thought it was cool that he could show me these amazing karate moves over and over and over. 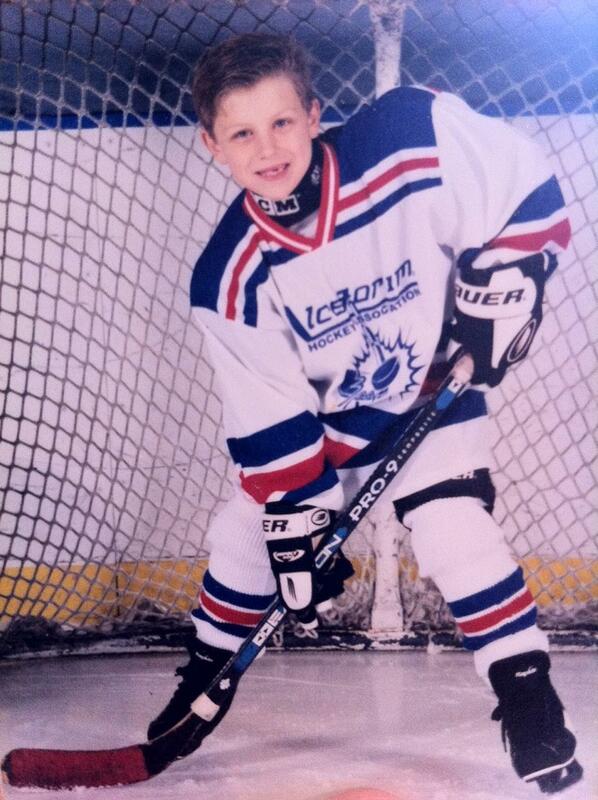 Matthew started playing ice hockey when he was 6 years old. His dad always enjoyed skating so he would take Matthew with him during regular skate time. Matthew saw the hockey players one day and immediately decided that was what he wanted to do. Of course he only came up to the waist on some of these players as they walked by but he was determined that it was what he wanted to do. He stared up at them in awe. They were gigantic! We signed him up for the “Mite” level hockey. The first time I saw him on the ice he looked so tiny but he skated quite well and even got the first goal for the team. That was my introduction into what is known as the loud obnoxious hockey mom scream. That was when I crossed over. I completely lost control and started screaming as loud as I could. How great was this? I even ECHOED in the ice rink. This was my calling. I was no longer the “team mom” for t-ball where I handed out snacks and juice boxes and clap when someone actually hits the ball. I was now a loud, screaming-in-your-face hockey mom and very proud of it. Now when they were younger, the boys needed help putting on their equipment and skates. Moms were allowed in the locker rooms, but I must admit I didn’t like going in there. Trying to explain how bad a hockey locker room smells like is like trying to describe the odor coming from a garbage truck as it whizzes by you. It hits you and you immediately have the gag reflex. I would hold my breath or breathe with my face buried in my sleeve. The locker rooms were being used hourly by all ages of players and it usually smelled like dirty shoes and B.O. I always felt like the smell stuck to me and if I walked around the smell would follow me. Sort of like when you go to Waffle House for breakfast and you smell like bacon grease for the rest of the day. I was actually happy when the year came around where the coaches said “No more moms in the locker rooms. The boys are growing up and they need their privacy.” Thank goodness. One season, Matthew was asked to skate out with the Atlanta Thrashers at Phillips Arena as the “Youth Hockey Player of the Night” for the singing of the National Anthem. He was especially excited because he had just lost his first tooth which made him look like “a real hockey player.” I waited with him on one side of the ice while they introduced the starting line up for the game that night for both teams. He was so excited when he skated out. I looked up to see his face on the Jumbotron above the ice. He skated up to the Thrasher players and looked up at them like they were giants. They smiled and said a few words to him and the National Anthem began. After it was over he skated to the other side of the ice and went through the Thrasher’s locker room where his dad was waiting for him. Afterwards we all met up.